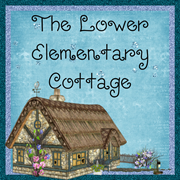 The Lower Elementary Cottage: Back to School Currently!! Today was my first real day of summer vacation! Yep, you read that correctly! There was so little time between jobs (a week) and it was mainly doing errands and packing/rearranging all of my teaching supplies at my house...which STILL have not all been moved. Then I jumped right in to summer school which just ended yesterday! But now it's time to do the fun stuff! Sleep, relax, lay by the pool, and help my sister with last minute wedding stuff before she gets married. Three weeks of freedom!! Whoo hoo! Added bonus...I have time to blog for fun things like Farley's CURRENTLY! Listening: I'm enjoying a night of nothing that I have to do! I've got my wine, tv, and Covert Affairs! I just love watching a woman in a tough girl role! 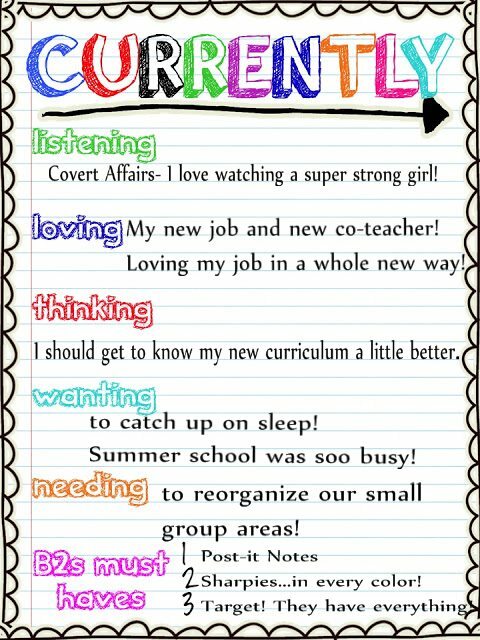 Loving: My new school and co-teacher Lauren! We jumped right in to teaching together with almost zero planning time together and we totally clicked! I had to talk to a parent yesterday who is placing her child in a school in the fall and wanted to know the differences between the school I came from and the school I now teach at. I was completely professional and respectful of my old position, but at the same time the woman clearly saw the advantages for me as a teacher at my new school! 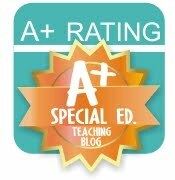 We have a great staff, great kids, and I couldn't ask for a better teaching partner! Thinking: My new curriculum is still not quite in my comfort zone. I've slowly figured it out, but it wasn't easy jumping in on chapter 8 where the last teacher left off! It was great for the learning curve of the kids, but I still need time to understand how it all works. There are sooo many hands-on learning materials (which are wonerful!!) but it's hard to figure out which ones they are referring to. One page said to use "Echo" and I thought that was some form of cards/posters/supplies...turns out it's the name of the owl puppet! The kids repeat after the owl! Wanting: SLEEP! I honestly was in my bed by 8:30 last night and out cold by 8:45! It's been a long summer of my alarm going off at 5:45. I loved that little second when I turned my automatic weekday alarm to the "off" position! Needing: to put some serious thought in our small group area organization! 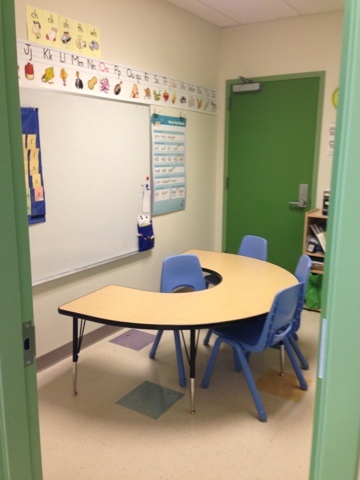 We have a tiny closet of a room for one area, and a horse-shoe table area in our main classroom. We swap who teaches where so that no one is trapped in the closet all day! I have the main room for reading groups and the closet for math groups. This poses a problem of the last teachers materials still being there from the previous group when the next group goes in. There is only a 15 min. break between the group sessions and it involves us taking the kids out to recess. We need to have a way for both of us to have our materials ready when we need them, but out of the way when the next person comes in. Don't let this picture fool you, there is NOTHING more to this room than you see in the picture! The other wall is directly out of view on the right of this photo. In fact there are usually 2 more chairs and a minimum of 5 humans in this room. There is a big closet, but it's triangle shaped and awkward to stack boxes and materials in it. I'm grateful for the separate room so we don't teach over the top of each other, but the organization of that back shelf needs some help. B2S Must Haves: These are obvious! I honestly went to Target not once, but TWICE today!